Letters of Pliny, Book VIII, Letter 24, to Maximus. Letters of Pliny, Book IX, Letter 5. Ashes were already falling, not as yet very thickly. I looked round: a dense black cloud was coming up behind us, spreading over the earth like a flood. ‘Let us leave the road while we can still see, ‘I said, ‘or we shall be knocked down and trampled underfoot in the dark by the crowd behind.’ We had scarcely sat down to rest when darkness fell, not the dark of a moonless or cloudy night, but as if the lamp had been put out in a closed room. Letters of Pliny, Book VI, Letter 20, to Tacitus. Description of the eruption of Mount Vesuvius which destroyed Pompeii in 79 AD. 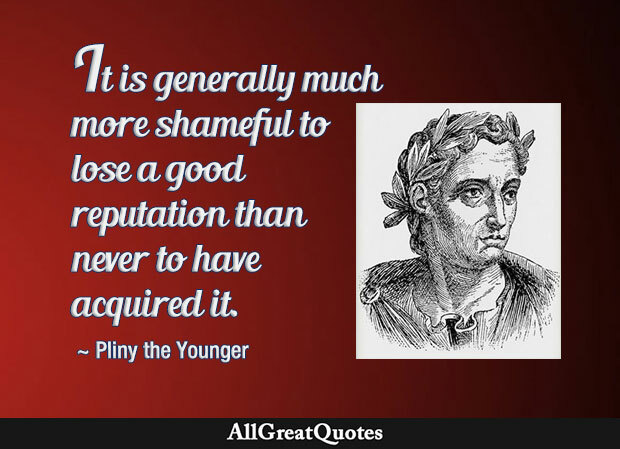 The 18-year-old Pliny the Younger observed the tragedy, which claimed the life of his uncle Pliny the Elder, from a distance of 13 miles away at Misenum where the Younger was staying. As in a man’s life, so in his studies, I think it is the most beautiful and humane thing in the world, so to mingle gravity with pleasure that the one may not sink into melancholy, nor the other rise up into wantonness. Letters of Pliny, Book VIII, Letter 21, to Arrianus. A dear bargain is always disagreeable, particularly as it is a reflection upon the buyer’s judgment. Letters of Pliny, Book I, Letter 24, to Bebius. Informations without the accuser’s name subscribed must not be admitted in evidence against anyone, as it is introducing a very dangerous precedent, and by no means agreeable to the spirit of the age. Letters of Pliny, Book X, Letter 97, Trajan to Pliny. There is nothing to write about, you say. Well then, write and let me know just this – that there is nothing to write about; or tell me in the good old style if you are well. That’s right. I am quite well. Unfinished paintings are more admired than the finished because the artist’s actual thoughts are left visible. However often you may have done them a favor, if you once refuse they forget everything except your refusal. It is wonderful how the mind is stirred and quickened into activity by brisk bodily exercise. It is better to excel in any single art than to arrive only at mediocrity in several. Letters of Pliny, Book III, Letter 20. Prosperity proves men to be fortunate, while it is adversity which makes them great. I contemplate the sort of friend, the sort of man I am now without. He completed his sixty-seventh year, a reasonable age for the sturdiest of us; I acknowledge that. He escaped from an interminable illness; I acknowledge that. He died with his dear ones surviving him, and at a time of prosperity for the state, which was dearer to him than all else; that too I acknowledge. Yet I lament his death as though he were young and in glowing health. I lament it – you can consider me a weakling in this – on my own account, for I have lost the witness, guardian and teacher of my life. He died full of years and of glory, as illustrious by the honours he refused, as by those he accepted. Such is the disposition of mankind, if they cannot blast an action, they will censure the parade of it; and whether you do what does not deserve to be taken notice of, or take notice yourself of what does, either way you incur reproach. The lust of lucre has so totally seized upon mankind, that their wealth seems rather to possess them, than they to possess their wealth. Letters of Pliny, Book IX, Letter 30, to Germinius. This expression of ours, Father of a family. Everyone must be given something he can grasp and recognize as his own idea. Everyone is prejudiced in favor of his own powers of discernment. Modestus said of Regulus that he was ‘the biggest rascal that walks upon two legs. And as in men’s bodies, so in government, that disease is most serious which proceeds from the head. To all this, his illustrious mind reflects the noblest ornament; he places no part of his happiness in ostentation, but refers the whole of it to conscience; and seeks the reward of a virtuous action, not in the applauses of the world, but in the action itself. It is allowed to poets to lie.